Please pop in there. Let’s all think about “kindness” and make it our goal to perform just one special act of kindness every day! It has to be a special act of kindness that actually takes an effort. Vic was a kind and generous person. Her legacy is one of kindness and generosity. 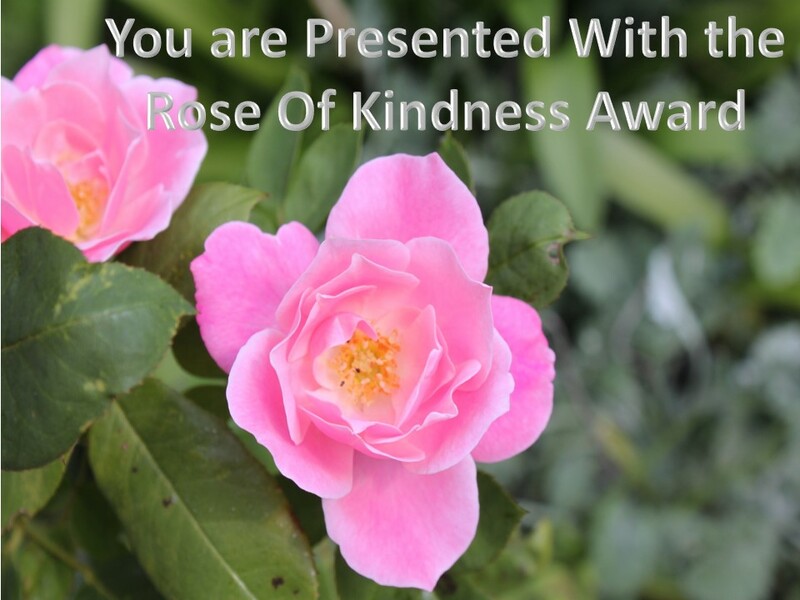 So I have come up with an award… The Rose of Kindness Award. I would like to add that we need to remember that our existence here is fragile, and we never have as much time with people as we think we do. If there is someone or someone’s out there that you love, don’t neglect that and don’t put off engaging with them because death waits for no-one… Be kind and gentle. Cherish your relationships remember to be kind…. Pay it forward! So I have to nominate some kind people. My treasured friend, Sandra @ http://thedrsays.org/, who is terminally ill and yet has so much kindness in her heart that she still reaches out to me and other people. This brave and selfless woman has made a difference in my world. She worries about her loved ones that she will leave behind. Thank you dear friend for caring when you have so much to deal with! You are always in my thoughts and prayers! http://behindthemaskofabuse.com is a heart wrenching blog about a woman’s life of abuse. She was raised by a narcissistic father, and a mother who rarely protected her from his verbal, mental, emotional and psychological abuse. She endured molestation, both inside and outside the family setting, raped at the tender age of 11 years old. This blog is written by an amazing person. A strong person battling recovery, anger and betrayal. She battles C-PTSD and BDD. Out of her pain two books were born and are published on Amazon “Buckwheatsrisk-Abuse Survival”, and a poetry book entitled “If I Could Write my Heart.” I salute you dear friend for your resilience and kindness. Out of your hardship a beautiful kind and caring human being was born. Thank you dear friend for the kindness you have shown! http://idealisticrebel.wordpress.com/ – Rebel is amazing and takes on the world! A kind and brave blogger who fights to make the world a better place. Rebel is a kind and generous friend. http://jmgoyder.com/ – My precious friend Julie who has so much pain and loss to work through. Julie writes about the love between her and her ailing husband. It is the most beautiful love story ever! Julie is kind and caring. Thank you for your loving kindness dear friend! http://valeriedavies.com/ A gutsy, wise lady who is a friend and an amazing writer. Thank you for your love and support. Judy is my dear friend who has guided me through this abyss of grief that I am walking…http://myjourneysinsight.com Judy reaches out to grieving parents. She offers guidance, advice and love. Thank you dearest Judy for your kindness and friendship. Shirley @ http://justiceforraymond.wordpress.com is a true warrior, fighting for justice yet always ready to extend a hand of friendship and support. Shirley taken on the judicial world to bring justice to the unsolved and uncleared and uncared for deaths. Thank you dear Shirley for your words and actions of kindness. Shaun @ http://prayingforoneday.wordpress.com/ is a kind and cherished friend. I sometimes feel bad because I know I cause him pain because of my grief. He reaches out wanting to make my life better. Thank you dear, kind friend. I know you don’t accept awards anymore so I truly understand if you don’t accept. http://kindnessblog.com/ I would be remiss to not award the blog that inspired this action. Thank you for the goodness you radiate in your blog. I could not find your name anywhere but I hope you will accept. Terry @ http://terry1954.wordpress.com/ is a kind blogger who cares for her brother deeply and passionately. She is a shiny example of how we should treat our fellow human beings and family – with kindness! An extra nomination – My beautiful, brave child who radiated goodness and kindness, this award is for you! You made the world a better place. I am proud to be your Mommy. This award photo is of the rose we planted at the front door…I love you angel child. My suggested act of kindness: On Mother’s Day and Father’s Day, remember any friends who have lost a parent the previous year, and check in with them. Those will be tough days. Lets start a wave of kindness! Tersia! This is absolutely wonderful and I’m so honored that such an amazing person as you would include me!! Thank you for your kind words and continued support!! You are welcome Brave Katie! You are a worthy recipient! You are such a worthy recipient! Thank you for accepting! You are a very worthy recipient!! Thank you for caring! I do feel bad, I want to help you. I am like that. Shaun I am so happy!!! The mother child relationship is so special. Of course it goes through ups and downs but it needs to be cherished. Please don’t feel bad. Nobody can make me feel better. I appreciate your gentle friendship and caring! It is enough!!!!! I wish I could take your pain away!!! Your heart is the right place y friend. Oh you did dear friend!! Thank you!!! What a beautiful award. Thank you so much! Dearest Tersia, Once again you humble me with an award. Thank you! I am touched, honored and proud to be your friend. This is the most special award. It comes from my heart in gratitude for the kindness you have shown me! You are an amazing person and you enrich my and many other grieving parents lives. Thank you Judy! Tersia, this word has been coming to me all day in blogs I’ve read, this comment which arrived in my blog, and now this beautiful award, ‘the rose of kindness..’. I am very honoured to be included in your list of nominees, and to find myself in such company. I know!! 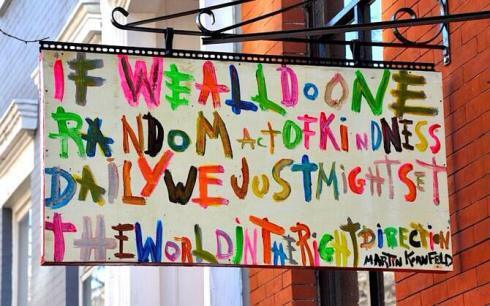 I read your post this morning and it is as if the Universe is talking to us about kindness. You are welcome! Thank you.